We've all heard stories of happy couples who set out to remodel their kitchens and end up getting divorced. I have never understood this. Sure it's messy, sure there's noise in the house, sure living on take-out food gets old fast. Life is temporarily disrupted, but it's certainly no cause for tossing away a perfectly fine spouse. All that gets you is more mess, more noise and more fast food. I saw a report the other night that the average kitchen remodel now costs $40,000. For what? Solid gold drain pipes? How can cabinets, counter tops, a few applicances and a little construction cost $40,000? What are these people doing, having faucets custom crafted from rare Angolan hardwood? I can see that spending that type of money on a single room of your house can cast doubts on the state of your partner's sanity, but a divorce is likely to be even more expensive. I just don't get it. Even Mr. Blandings's family got through building their entire dream house with no more than a great many pointed quips and some rolling of eyeballs. Restoring an old Volvo is, of course, a different matter entirely. You can plan a kitchen remodel because you're starting from a known point. All this old stuff gets ripped out; all this new stuff gets put in. With a Volvo, all planning is futile. You can be sure that there's rust you don't know about at the start and there's no telling how much. You never noticed that the whole car is bent -- it always balanced on three out of four jack stands because the garage floor must not be level, right? And when your project gets to the point where those things are known all too well, no one can really even guess what it will cost to fix it. Fenders were not attached at this point, only placed on for the photo. That's the wrapped-up wiring harness sticking up from the engine compartment. Let me say right up front that Bob Moreno is one of the nicest, smartest, most honest and straightforward people you're ever likely to meet. He charges substantially less per hour for world-class work than your local Maaco place does for whatever it is they do. He and his crew hustle right along and they know their business. Your stomach may churn every time you get another invoice from him, but you invite him over for dinner anyway. He's that kind of a guy. Bob was always right up front with us. 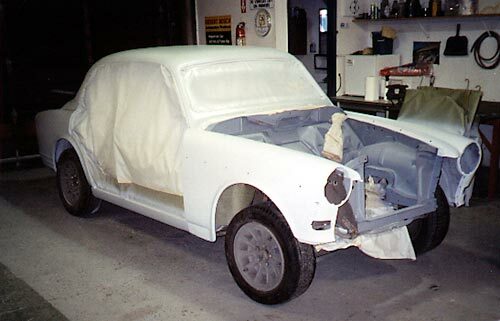 He took a good look at our 122S before Shayne took it mostly apart, and figured he could fix and paint the body for around $6000, little knowing what evil lurked in its heart of Bondo. That's a hunk of change to put into an old Amazon, but considering our history with the car and the impeccable quality of Bob's work, that didn't scare us. After Shayne uncovered more rot and the car was hauled down to The Works so Bob could discover it was bent, that went up to $10,000. This gave us pause. Bob was the first to say, "You know, I can find you another car that doesn't have all these problems, fix that one, and it will cost you far less." So, maybe $6K for a different car versus $10K for our car... well, we wanted our car still. $4000 just for sentimental value makes no left-brain sense at all, but the right brain can swallow that. Just barely, and with a lot of gagging -- but 20-some-odd years of owning one particular old Volvo can do that to you. We had put away a fund with the idea of restoring all three of our cars, but maybe one of them could wait for another time. So what if we could only do two right now -- let's get this one done right. Bob fabricated the new floor by hand. The entire interior was later sanded out and sprayed with black POR-15 to prevent rusting ever again (we hope). The money drain got worse, which was partly our fault and partly no one's fault -- no one we know, at least. 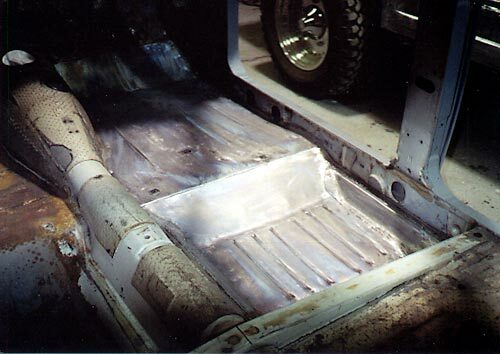 The only available replacement floor panel turned out to be junk, so Bob had to fabricate a new floor from scratch. It can't be just flat metal, but has to have bumps put in for rigidity like the original and has to dip down so rear seat passengers don't have to sit with knees around their ears. Tack on another grand or so for a hand-made floor. Piddly small problems crop up, like the little metal channel that holds the door seal on is rusted out on the bottom of one of the doors. What's it cost to drill a section of unrusted little metal channel off the donor car, clean it up, cut it to length, and spot weld it onto our door? Probably a few hundred bucks in labor. I could look it up; every single thing that was done is documented on the invoices, but I really don't care anymore. Such things are not negotiable -- the door seal will need to be held on, and so that little metal channel needs to be fixed, end of discussion. Repeat as required until there are no more small piddly problems to deal with. 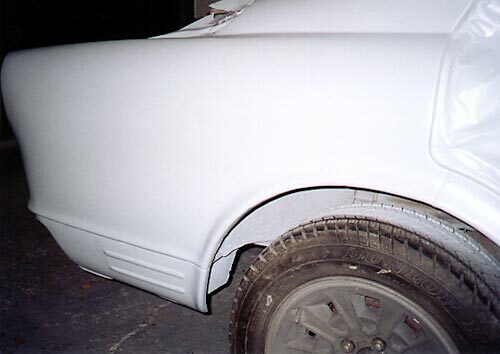 All removable panels were repaired, prepped and painted separately. Hinges and inner door caps are hanging at the right. The part that's our fault is that we really wanted some pearl in the paint. Marsha had talked about this for years. "Look at that Lexus -- I don't like the color, but see how it changes when you move around it? The Volvo should have paint like that someday." She wasn't about to back down now, especially after months of looking at paint samples and every bluish or silverish Nissan that went by. 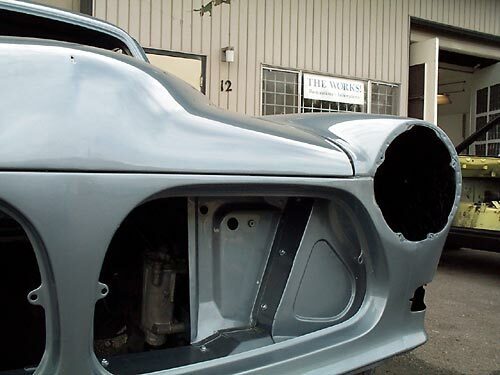 It was at the Watkins Glen meet last summer that she saw a blue-gray metallic '70 or '71 1800E and decided on that for the base color, so we had Bob spray up a sample with various amounts of pearl in and over the paint. Marsha's a graphic artist, and color is a big deal to visually-oriented people. If we were spending this much on getting the metal back into shape, we weren't about to paint it with anything less than what she wanted. Pearl is expensive, Bob explained repeatedly, because it reveals any flaws in the bodywork. 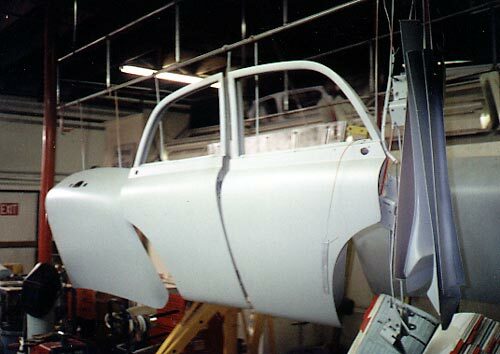 As the car came together, there was a point where everything looked really good in primer. If Bob were to shoot the car in white right then, he told us, we'd have a show-winning paint job. If he shot it with pearl -- and particularly pearl mixed with metallic -- we'd notice a lot of dips and bulges right away. Pearl requires considerably more prep time. Add another grand or so for more sanding and primer and sanding and primer and sanding. No rust, no holes, no visible weld, but it's not good enough yet. Even I can see some lumps in the lower section behind the wheel arch. I wanted to lose the V-O-L-V-O letters on the front of the hood. I always thought they detracted from the nicest lines on the whole car. Also, the trunk lid we'd gotten from Shayne came from a Canadian 123GT. Our car is a Swedish 122S. Lose the holes where the Canadian and 123GT badges were on the trunk lid, too. What's it cost to fill all those holes so no one would ever suspect they'd been there? I have no idea. I'm afraid to look. After maybe six months of this, Marsha and I started freaking out entirely. What had been "Just think how nice it will be to have the Volvo all beautiful again" had turned into "Don't talk to me about the [expletive deleted] car. E.v.e.r." This was hard for our friends to grasp. "Hey, I was just down at The Works and your car is coming along really great!" would get you physically assaulted. Well, no, but close. We started quarreling about nothing. Shayne had put in a huge amount of work getting the car ready to go to Bob's and had provided lots of body parts. He had steadfastly refused payment of any sort. Now, when the motor in his mother's 140 gave out, I gave him the motor he'd taken out of our car. It was already at his house and I didn't want to reuse it anyway -- it's the motor I wrote the "How Not to Build a Motor" article about; a reliable, balanced runner that would be perfectly fine in a car that doesn't need to go as fast as I like our cars to go. It was the least I could do. Even that got us into a brouhaha. "What do you mean you gave away my motor? You didn't even ask me first! Don't you care what I think about anything?" And so on. I'd always said the Amazon would get the motor currently in my 1800, but no matter. This particular tiff would resurface whenever a new invoice arrived, and we both knew it was entirely silly. In more normal times, Marsha would never begrudge Shayne anything, but that wasn't the point anyway. Everything about the project had taken on an emotional impact in direct proportion to the expense involved. 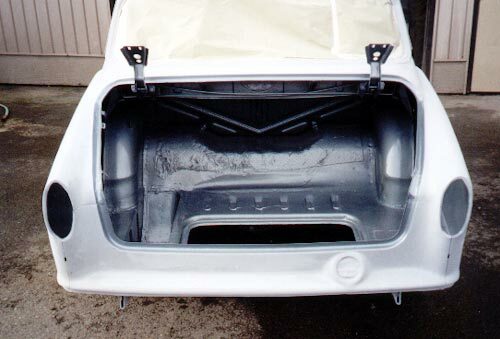 The door jambs and the inside of the trunk and engine bay were painted before the exterior. This was our first look at the final color, Volvo #102 with 20% blue pearl mixed in. It didn't help that I'd buried myself in after-hours computer work, partly just to keep us afloat in spite of the financial black hole down in Eugene. We are by no means wealthy people, and a few hundred dollars a month for car projects is usually the limit for us. Now we were dealing with a few thousand a month. The fund that was supposed to restore three cars was exhausted before one car was finished. After three or four months I was starting to stumble around speaking in programming languages, which doesn't make for good conversation over dinner (or any other time). I dreamt about websites every night. I did consulting jobs. I wrote part of a computer book. I got a tan from staring into monitors. As company, I was worthless. Oh, and wasn't I supposed to publish several issues of VClassics in there someplace? Hahahahahaha! And then one day, quite suddenly, it was over. The car was painted, with six coats of clear over the top, no less. Should Bob start on the interior, or put anything else back together, or what? I had to say no, we can't manage that right now. Send it back to us. We now owned a $17,000 rolling body with no motor, no transmission, no interior, no electrical system, no trim -- not even a steering wheel. I honestly had no idea whether to feel happy about this or not, but I can tell you this: Someday when we buy a house, we're getting one with the kitchen already fully remodeled.